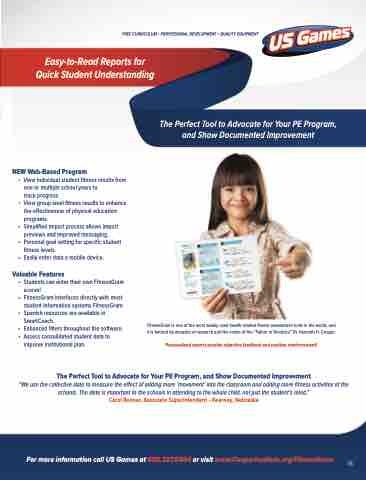 • View group level fitness results to enhance the effectiveness of physical education programs. • Simplified import process allows import previews and improved messaging. • Personal goal setting for specific student fitness levels. • Easily enter data a mobile device. • Students can enter their own FitnessGram scores! • Spanish resources are available in SmartCoach. • Enhanced filters throughout the software. FitnessGram is one of the most widely used health-related fitness assessment tools in the world, and it is backed by decades of research and the vision of the “Father of Aerobics” Dr. Kenneth H. Cooper. Personalized reports provide objective feedback and positive reinforcement!